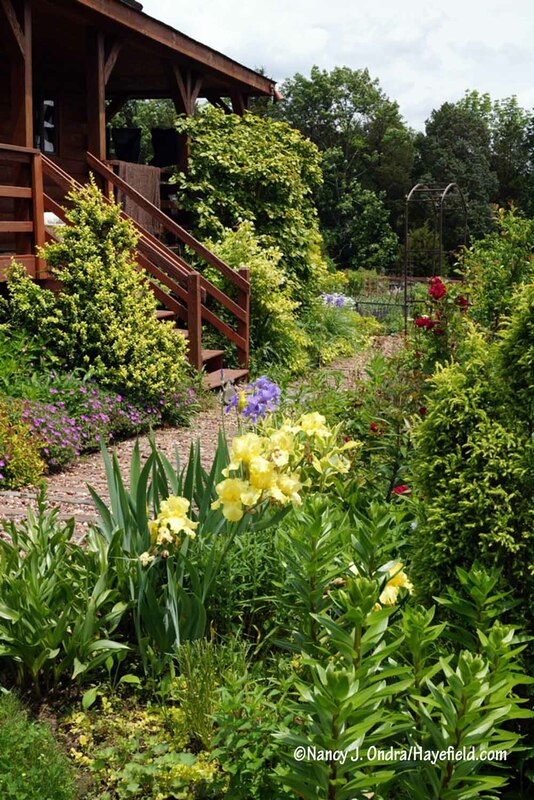 The sudden heat has brought a sudden stop to most of the irises, but they were lovely while they lasted. 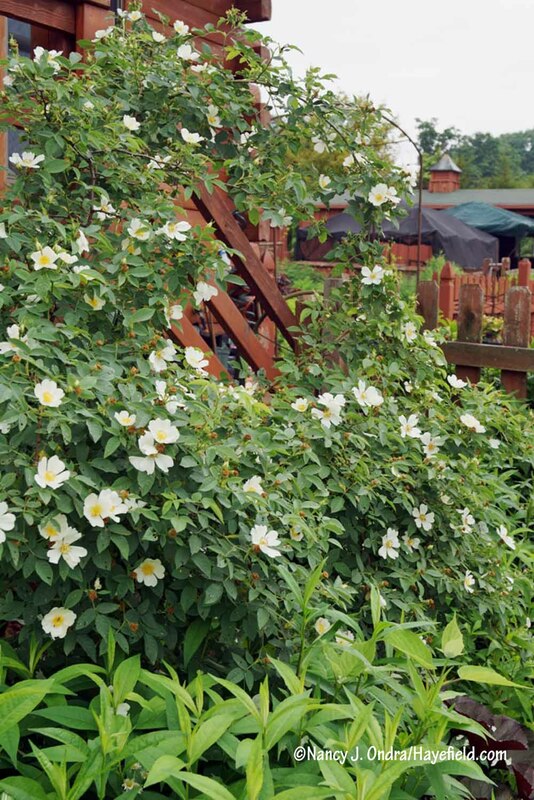 That photo reminds me: Has anyone else noticed their amsonias flowering twice this year? It’s a first time for me; something to do with our unusual weather, I guess. Anyway, there’s no shortage of other perennials gracing the garden right now. Flowering here for the first time: cruel plant (Cynanchum ascyrifolium). 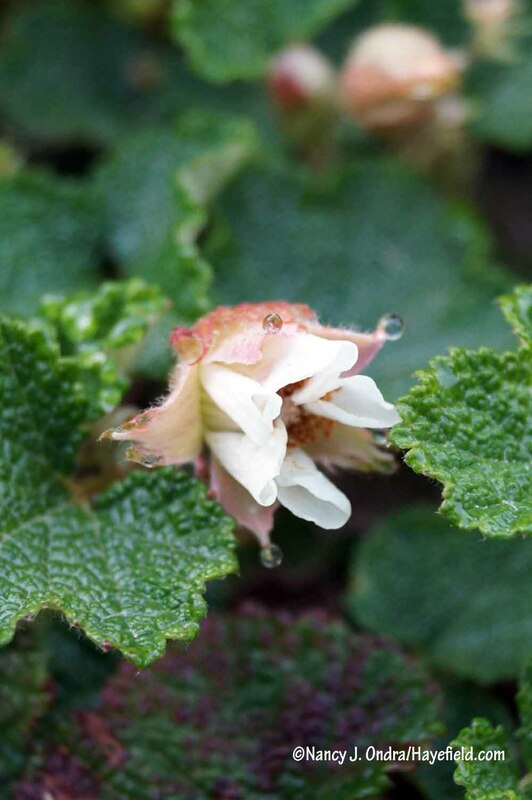 Thanks to Kathy Purdy of Cold Climate Gardening for sharing this little-known perennial! Another new addition for this year: ‘Masterpiece’ candytuft (Iberis). 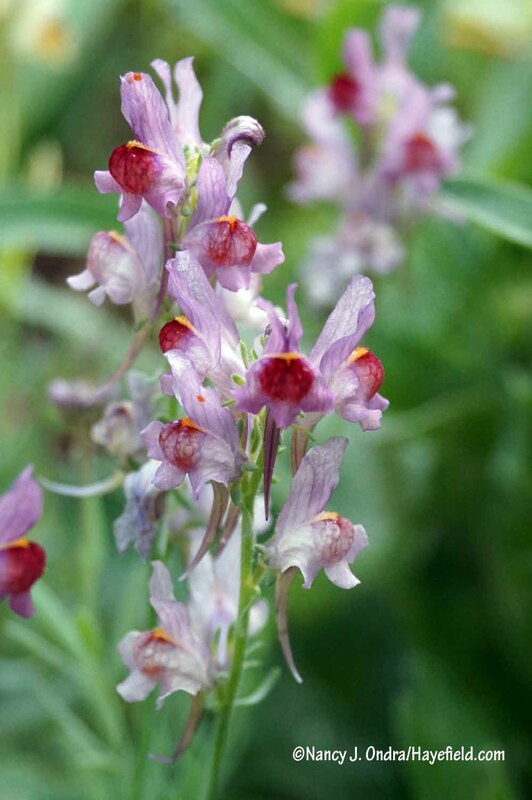 It’s supposed to be perennial, and to flower from May until October. We’ll see. I can say that it has been flowering for 6 weeks now, which is longer than regular perennial candytuft, but it’s a long time until fall. Dwarf culinary sage (Salvia officinalis ‘Nana’). I know this isn’t all that special, but I think it’s the first time I’ve had culinary sage bloom here. I generally have to grow it as an annual because the plants almost always succumb to our winter wet, but I overwintered it in the basement and replanted it in April. So, it’s kind of cheating, but it’s in bloom, so it still counts. 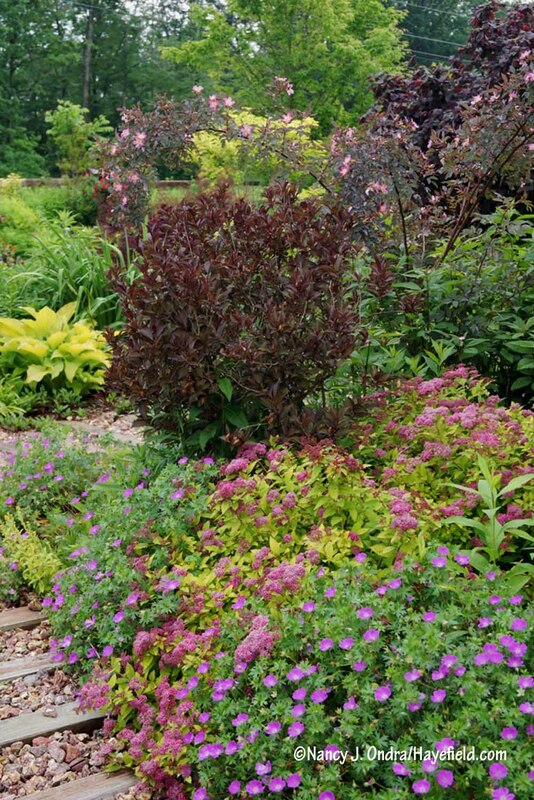 Some annuals are also contributing to the wealth of blooms this month. White lace flower (Orlaya grandiflora): an innocent-looking beauty with a strong will to reproduce. It requires ruthless deadheading to keep it from seeding aggressively. I find that annual poppies that self-sow always are more vigorous than those I try to start. But wow, this patch of ‘Drama Queen’ really outdid itself. Just look at that lovely fringe. Backlighting really brings out this poppy’s red petal tips. ‘Drama Queen’ is certainly well named! After several unsuccessful attempts in the past, I finally had luck getting mignonette (Reseda odorata) to flowering stage this year. 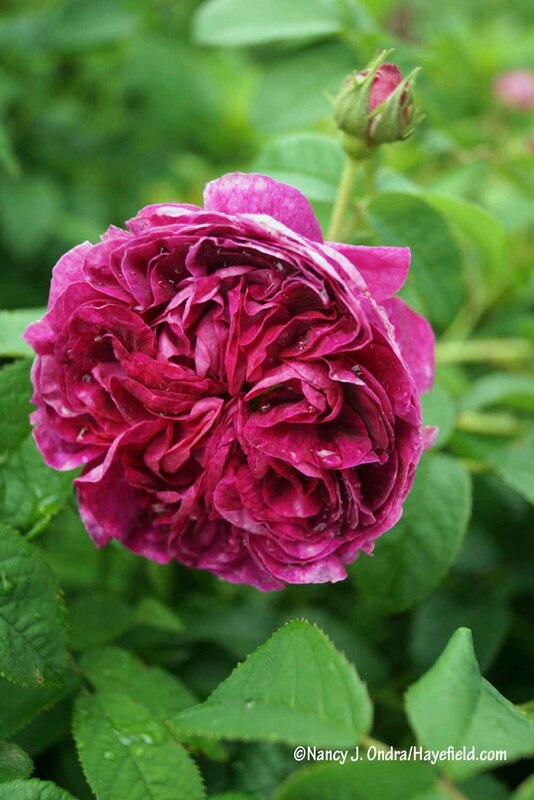 As with many scented flowers, descriptions of its fragrance vary widely. To me, they smell exactly like Dr. Pepper (that’s a soft drink, for those of you outside of the U.S.). It’s been a surprisingly good year for the garden roses. I’ve lost so many to rose rosette disease over the years that it surprises me to see any still around, but a few lingering plants really performed well this year. 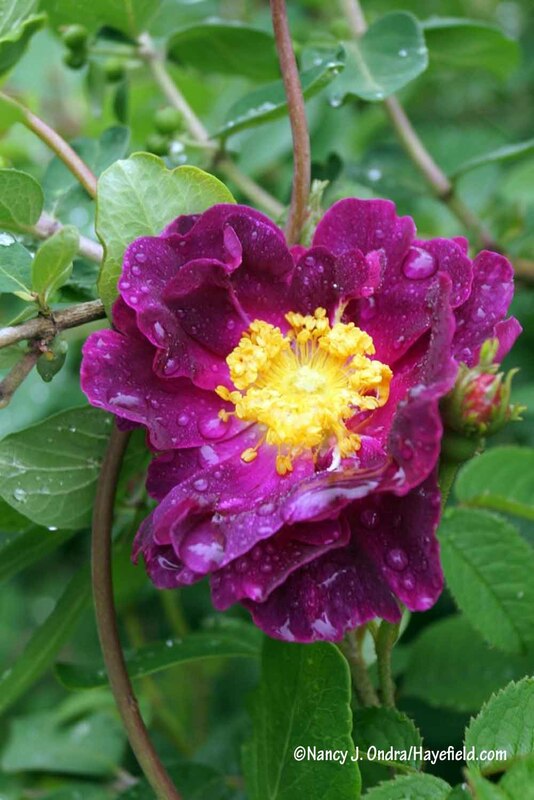 Flowering for the first time in over a decade: the Gallica rose ‘La Belle Sultane’. The poor thing has been popping up here and there in the Happy Garden for many years but apparently never got enough sun until I cut down the big winter honeysuckle (Lonicera fragrantissima) clump that was growing nearby. 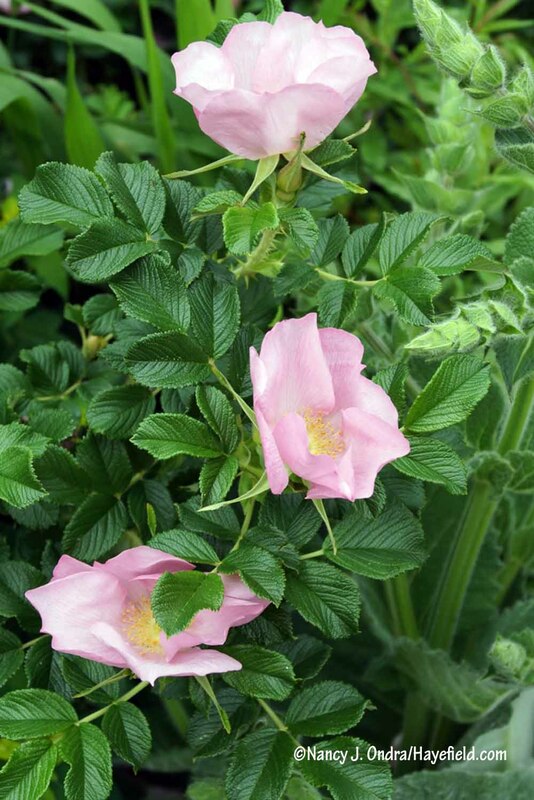 Rosa achburensis flowers for a very short time–usually just a week or two–but it puts on a great show of abundant, brightly colored hips in fall. 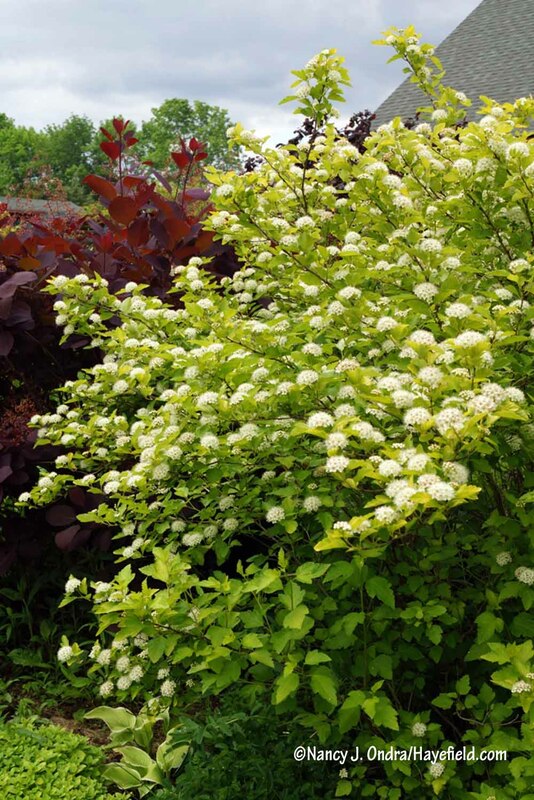 Other flowering shrubs are kind of in a lull at the moment, but ninebark (Physocarpus opulifolius) always puts on a nice show if I haven’t cut it to the ground in spring. 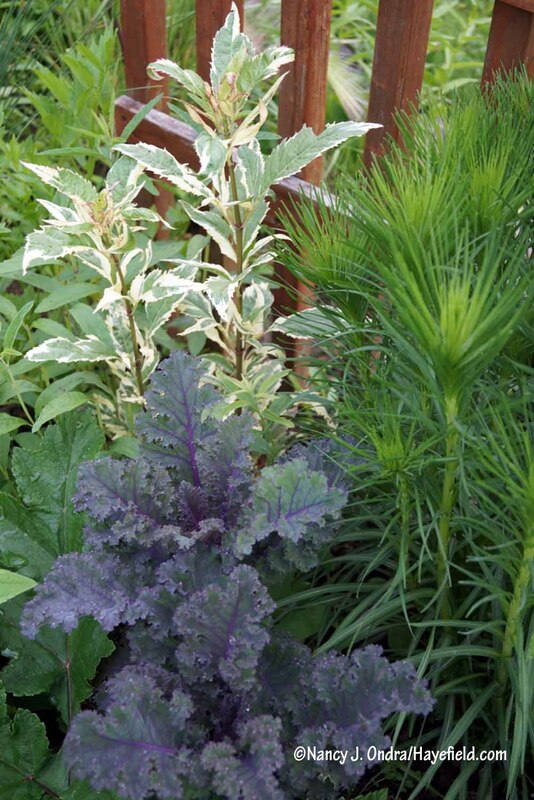 If we’re going to enjoy features beyond flowers, then this is the place to slip in a few more seed, fruit, and foliage favorites. 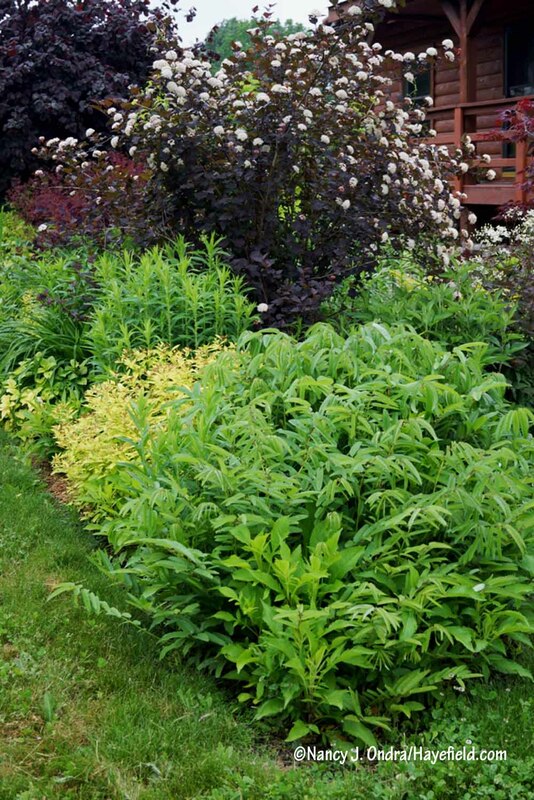 It’s kind of a shame that, just as they start to look lush, it’s time to do heavy pruning of the perennials in the front garden. 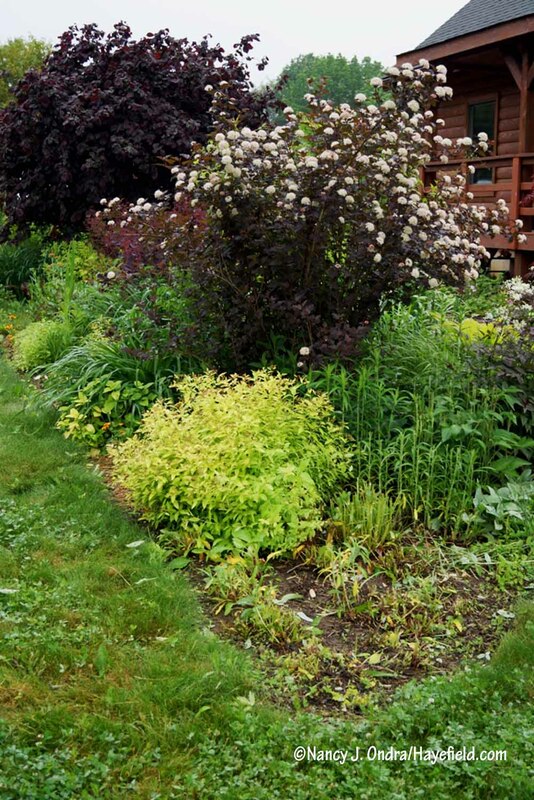 The gaps look bad for a few weeks, but I’ve learned that if I don’t cut the Japanese burnet (Sanguisorba tenuifolia) and orange coneflower (Rudbeckia fulgida var. fulgida) to the ground and shear the New England asters (Symphyotrichum novae-angliae) and ironweeds (Vernonia) back by at least half now, this area would be a crowded, sprawly mess by early September. …but it doesn’t look too bad from this direction. So far, I’ve been making good on my resolution to keep up with the vegetable garden. At this point, I have pretty much every square inch planted and weeded, and now I’m mostly watering and mulching. Remember the junky “cutting garden” area I showed back in April? 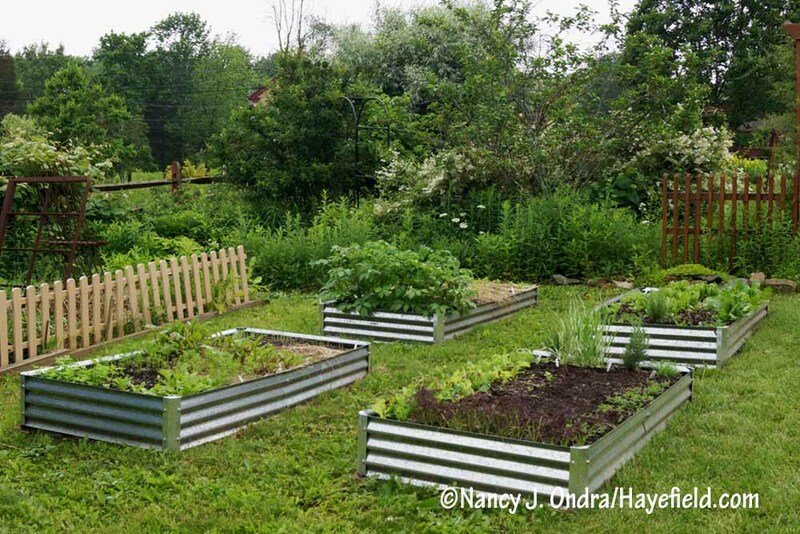 It looks much tidier now with these new galvanized raised beds. 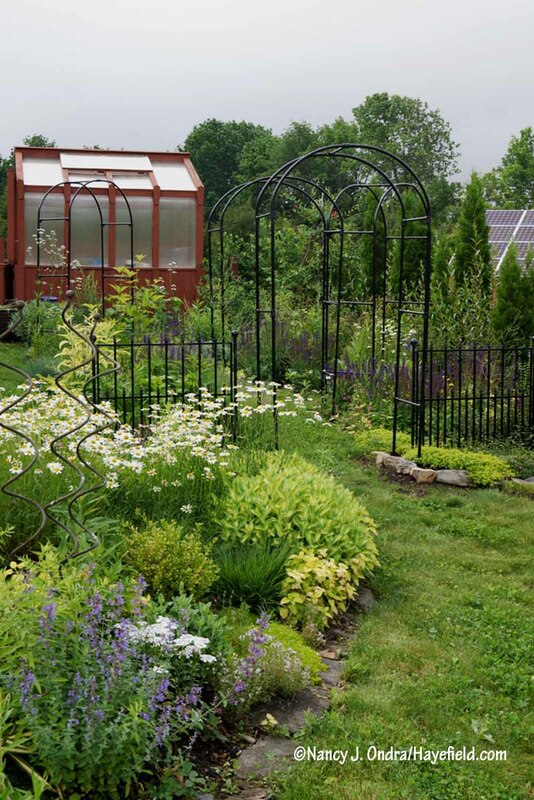 They–and much of the larger part of the vegetable garden, too–are filled with seed gifts of wonderful oddities and interesting Italian heirloom beans, corn, and squash from Clark Lawrence of La Macchina Fissa. 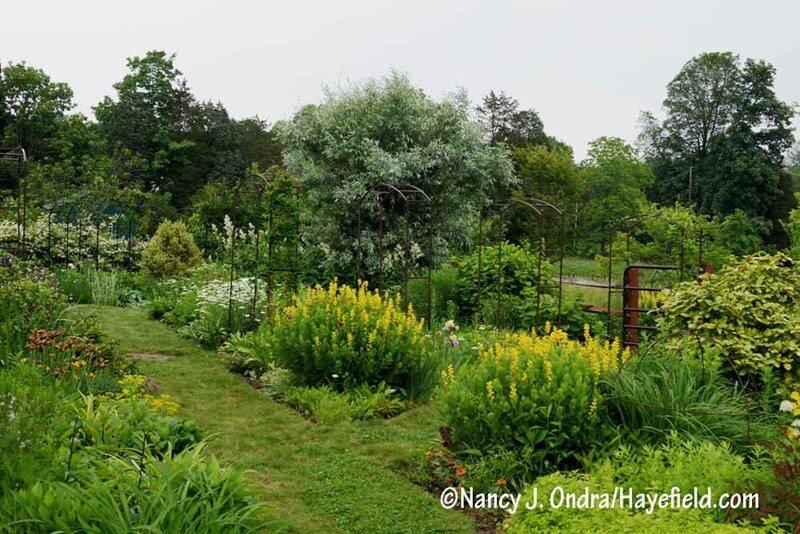 And to finish, I couldn’t resist tossing in some pictures from my porch–particularly the side porch, which gives a superb raised view of the gardens. 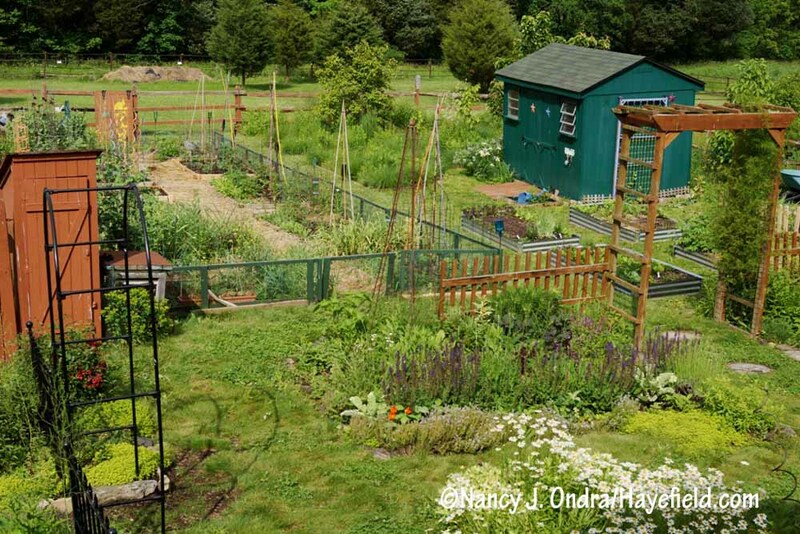 What will the next month bring for the garden? All we can do is hope for seasonable temperatures and regular rainfall, then deal with whatever we’re actually given, and enjoy our gardens in the meantime. 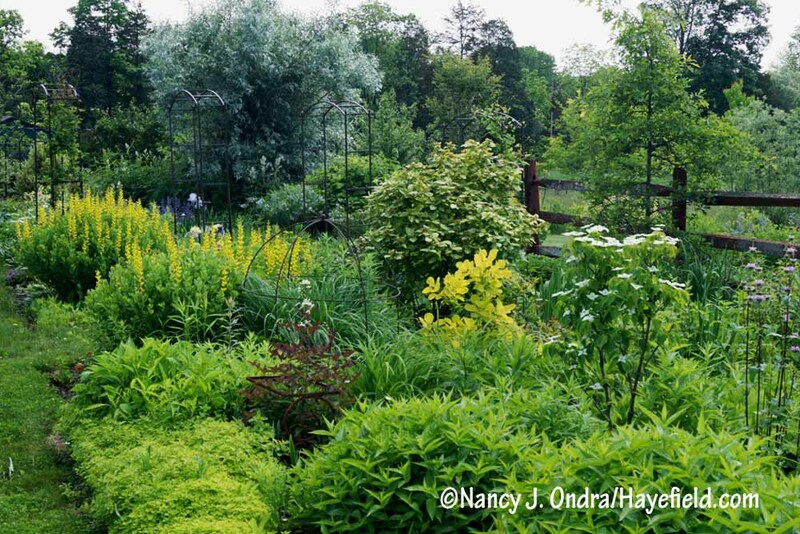 When the weather wherever you are isn’t conducive to being outside, do some virtual garden visiting among the participants in this month’s Garden Bloggers’ Bloom Day. You can find them in Carol’s main GBBD post at May Dreams Gardens. Enjoy! Nan! 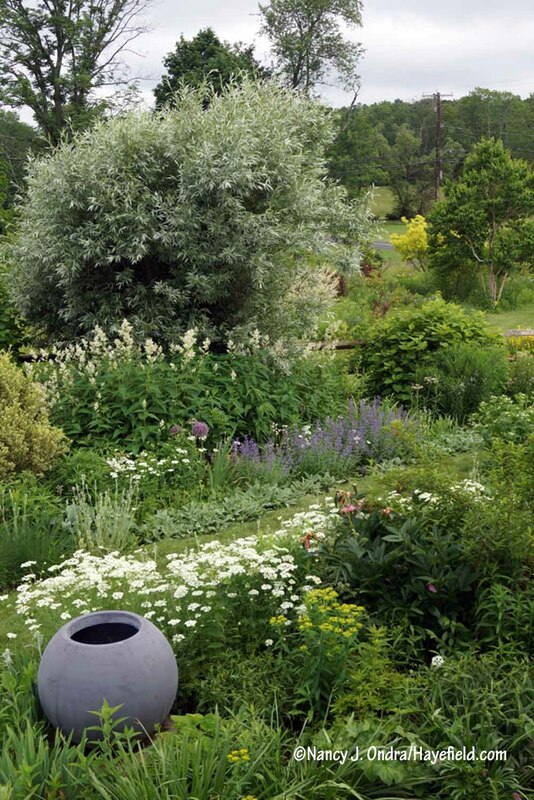 I love the shape, size, and color of that gray pot. How incredible that your Gallica rose ‘La Belle Sultane’ was hiding in the shade for over ten years, but flowered again with the gift of sunshine. Those tiny flowers are so perfect, aren’t they? The whole place is looking great, so as they say here, Bravissima! 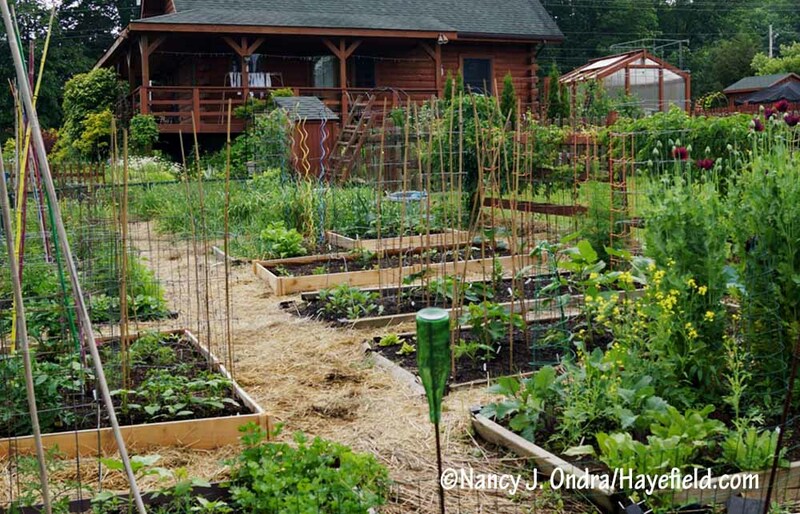 I know it isn’t the exceptional soil or climate that makes your garden outstanding – it’s you! Hi Clark! That pot was left over from the containers book. I like it better without plants in it. And thank you for the kind words. I owe you a longer email later today! You never fail to impress, Nan! 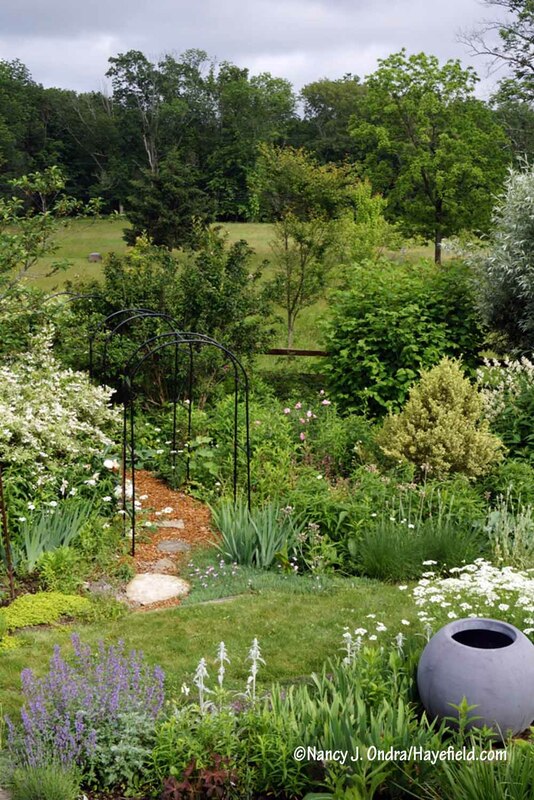 I did a quick scan of your wonderful garden and look forward to being able to slowly stroll through later with a cup of tea and a notebook. I spent the past week or so looking though your past postings and have a long list of ideas for my garden. I do have a question. I noticed you have quite a bit of stipa grass. 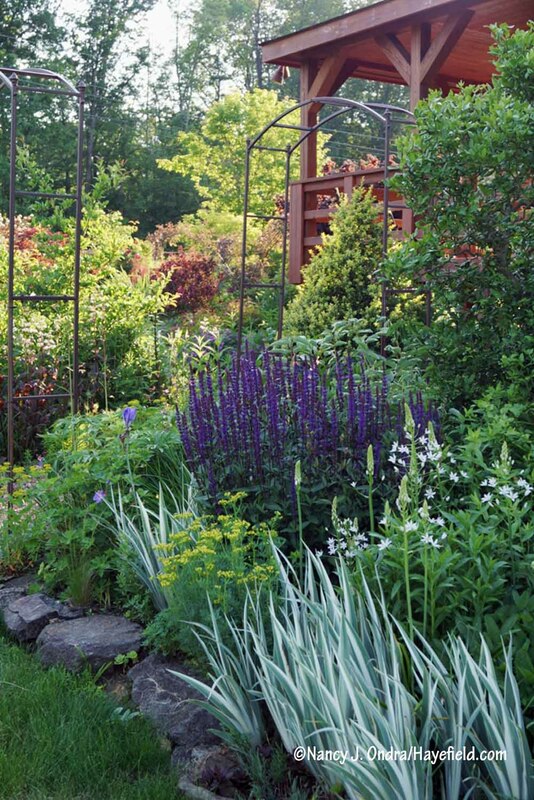 I have been drawn to it in photos of the “Dutch wave” garden style lately. There seems to be no other grass that can give that soft, white wispy effect. Have you found it to be an aggressive self-sower? That has been my fear. I actually passed up on buying some at a local nursery because I was afraid it would get out of control. I had never seen it offered in my area before and wonder if I missed out on a great grass? Hi Debbie! You may need a whole pot of tea; it’s a long tour. No, Stipa tenuissima hasn’t been a weed problem for me; rather, I tend to lose most of it over the winter, so I’m grateful for the few seedlings I find. It *can* be a serious problem in some climates, though, so you may want to do some research on how it performs in your area before you try it. Love the iris ‘Lion King’. This is one I will look out for. It’s a beauty but a little tricky to find good companions for. 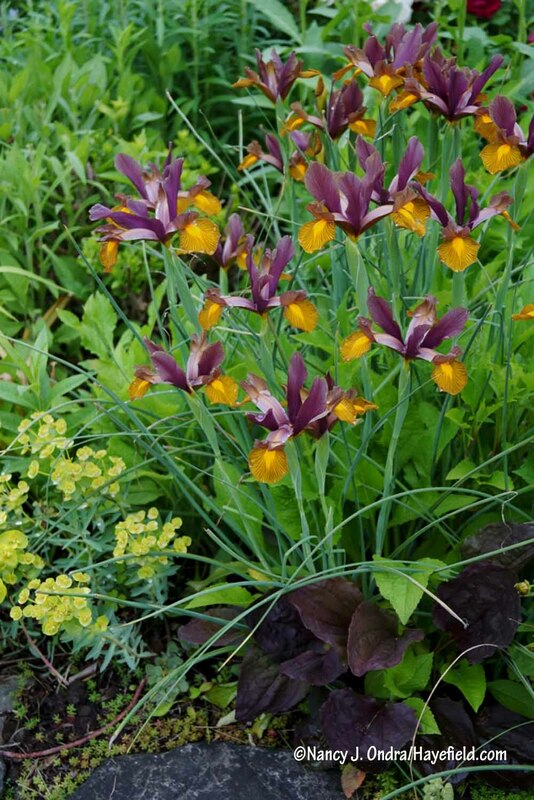 Chartreuse seems to work well, and I think the purple-leaved plantain does a nice job echoing the dark veining on the iris, so another dark-leaved partner would likely work as well. 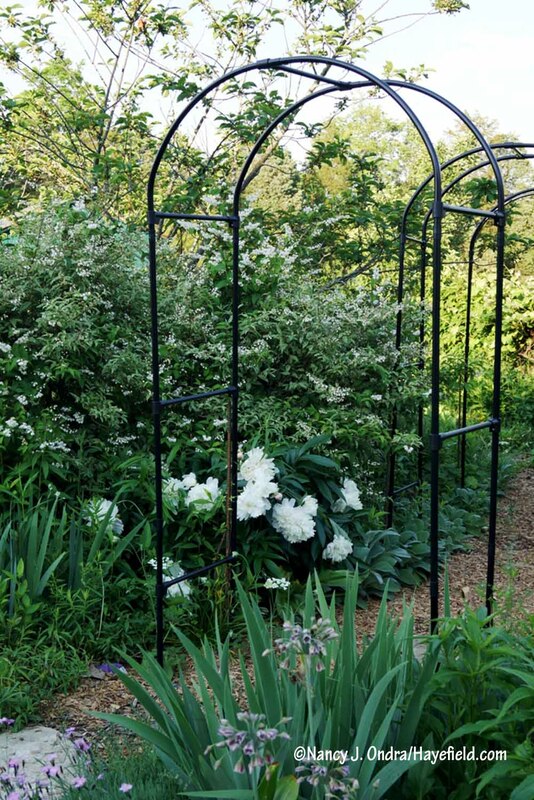 My new garden is much smaller, but your posts always inspire – and suggest new plants to lust after. Good to hear from you, Pat. 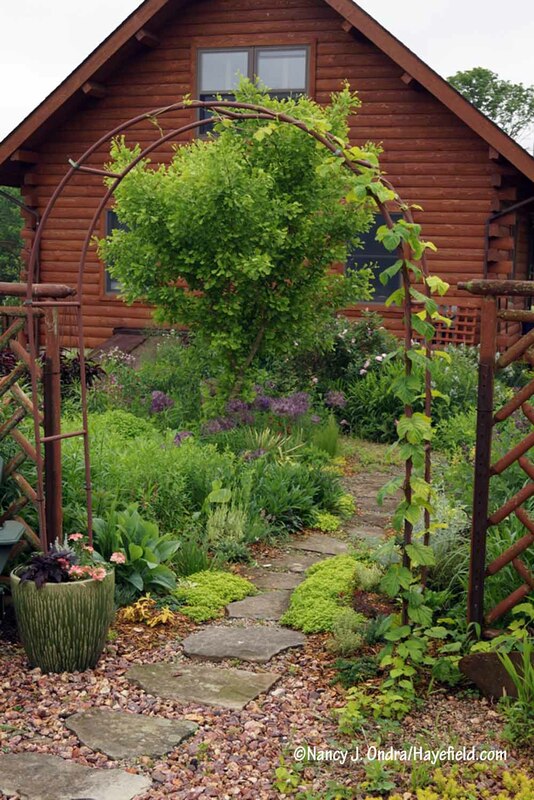 Small gardens are as much of a challenge as large ones, aren’t they? Can your Dutchman Pipe survive the winter? I grow a tropical kind here and they cannot take a hard freeze and are evergreen. 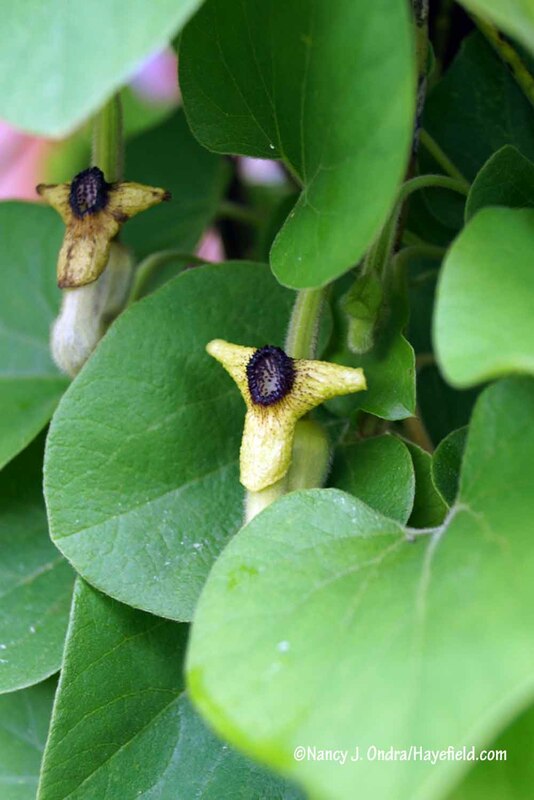 Yep, Aristolochia macrophylla is fully hardy here in Zone 6/7, though deciduous. What a pleasure to wander in your garden if only online. I always find new plants and ideas and rediscover old friends I’ve forgotten about. Loved seeing shots of the plants in situ. I’m so glad you took the time to visit, Linda. I know a few folks like to really study the photos, so I thought they might find those overview shots of use in placing some of the tighter views. Oh, I appreciate the suggestion, Liesbeth; I wouldn’t have thought of that! When your garden bursts into bloom it doesn’t mess around! My heart melted over those beautiful Iris at the top of the post and I oohed and aahed throughout the rest of the post. 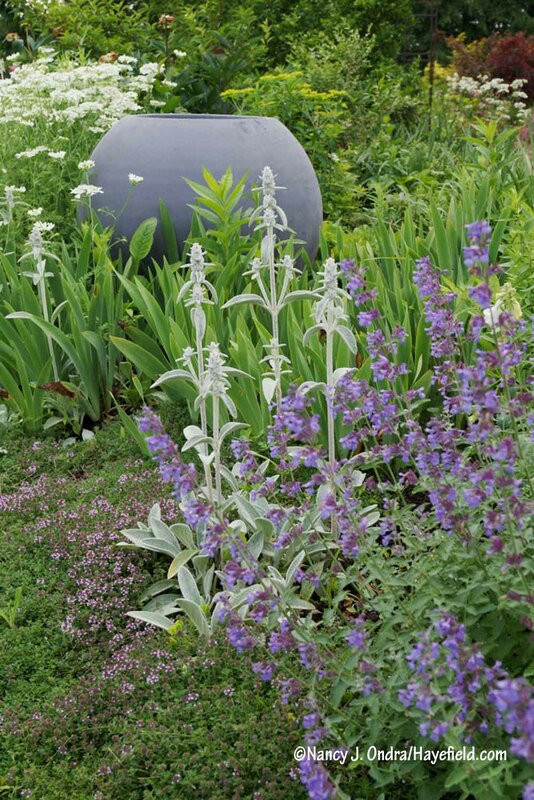 The mauve-flowered Phlomis tuberosa grabbed my attention but P. purpurea is probably a better fit for me if I decide to add a Jerusalem sage in that color. So sorry, Kris: I’m glad you could enjoy the irises vicariously, at least. You’re probably quite right about the Phlomis tuberosa not working for you, since it’s adapted to more moisture. I can envy you the yellow species in return; it has never liked me. Nan, is it Phlomis russeliana that you can’t grow? I planned to order some for my garden but now I’m worried it won’t survive. Is it too much moisture that is the problem, disease or winter cold? I don’t want to waste my precious gardening space to something that is going to sit and decline. I assume my growing conditions down in the Roanoke, VA area would be similar to yours. Just a few more mountains. Yes, that’s one I failed with. The cold hardiness shouldn’t be an issue; it’s winter wet. 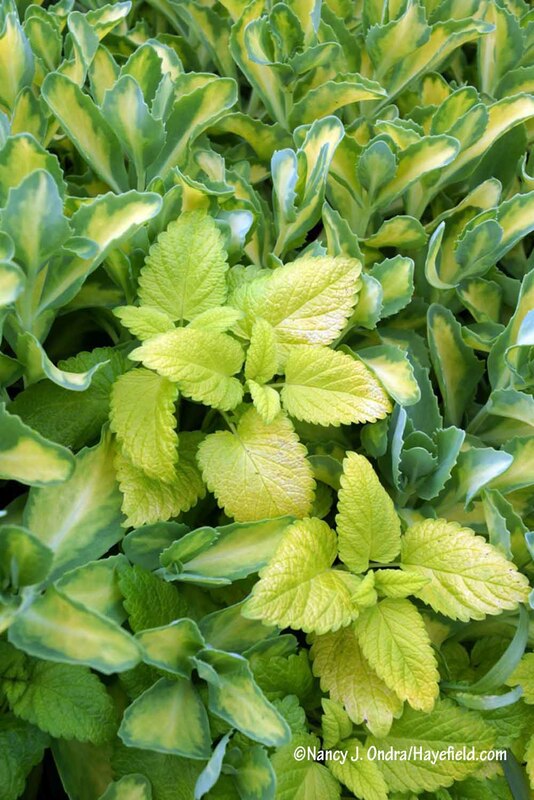 That’s particularly a problem for perennials with fuzzy leaves that are around through the winter. I wouldn’t want to discourage you from giving one a try; it may well like you better! 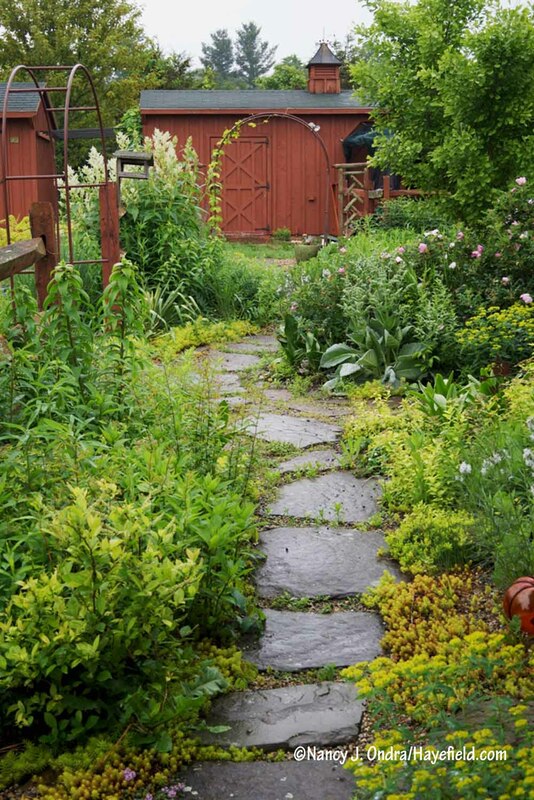 what are the pretty red blooms in your “happy” garden picture? the poppies were “dramatic” indeed! That is the appropriately named ‘Oso Happy Candy Oh!’ rose, pj. And yes, ‘Drama Queen’ was also well name! So spectacular, but of course I take away what I can possibly grow in Los Angeles, like that Dianthus cruentas paired with the yucca. ‘La Belle Sultane’ was definitely worth the wait. And for some reason I thought the ‘Drama Queen’ poppies were shaggier without much shape — now that I see yours, I love them! Funny about orlaya being a pest for you, because I was hoping to find a few seedlings in the garden this spring, but not a one. Your baptisia are incredible — I saw what hail can do to an emerging stand in Denver, so it’s nice to see them pristine. I’m glad you found a combo that might work for you, Denise. I hope to collect seed of the Dianthus cruentus; if you need some, let me know. I wonder if you’re too warm for the Orlaya to self-sow? It seems to need a cold period to germinate, but I could be wrong about that. I can imagine that hail would do very bad things to a baptisia in full bloom. It’s not something we often have to deal with, fortunately. I absolutely love your garden. Am amazed that you have such beautiful peonies. Would those grow in Texas? East Texas. Thank you, Jan; I love my garden too! I’m pretty sure that most herbaceous peonies wouldn’t be happy in your climate (not enough winter chilling for the flower buds to form, I suspect), but I encourage you to reach out to other gardeners in your area to get first-hand advice. 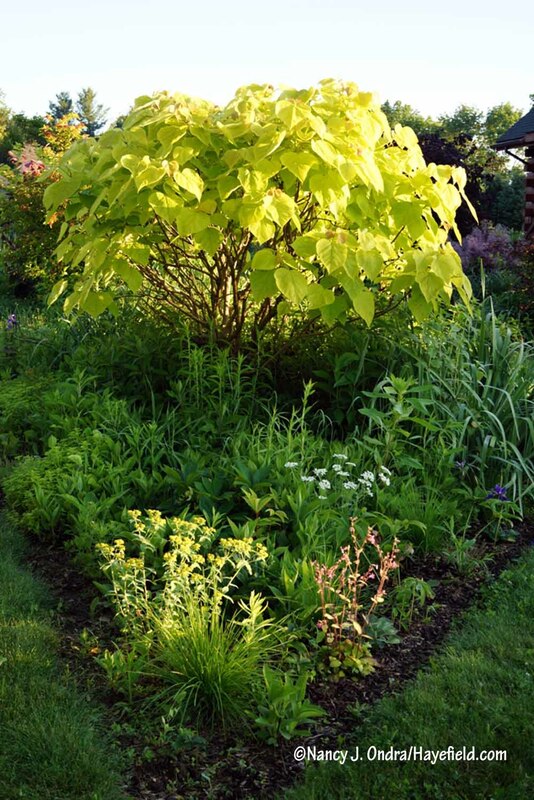 Love the Golden Catalpa! 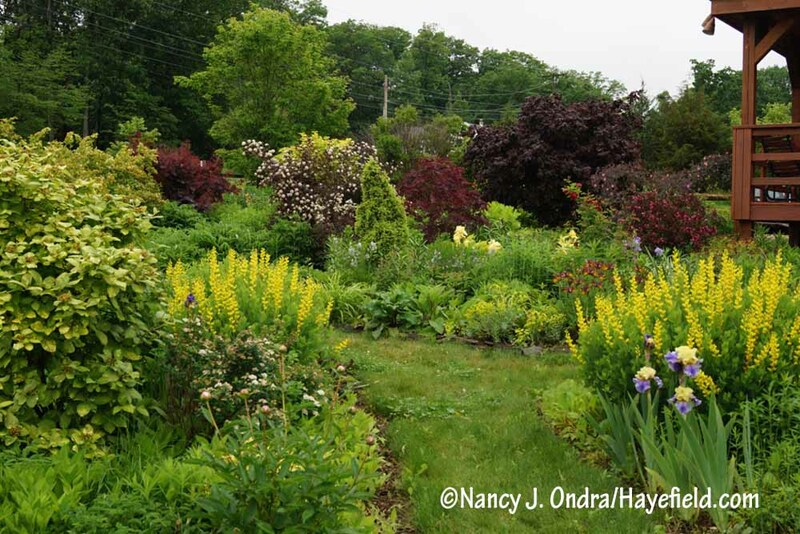 And the Screaming Yellow Baptisia too….are the two clumps in the side garden one plant each? Everything is so healthy looking. They are both *quite* yellow, aren’t they? 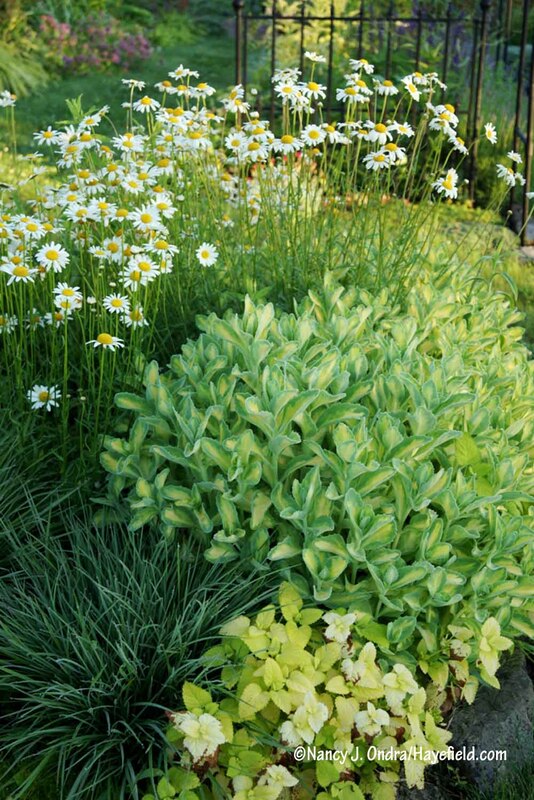 Yes, the baptisias are one plant on each side of the path. I’d guess they’re about 12 years old now. I cut them back by about half as soon as they’re finished flowering, so they don’t sprawl and smother everything around them. Great post, Nan, so much going on in your garden. Love that Drama Queen poppy! Where do you get seeds? 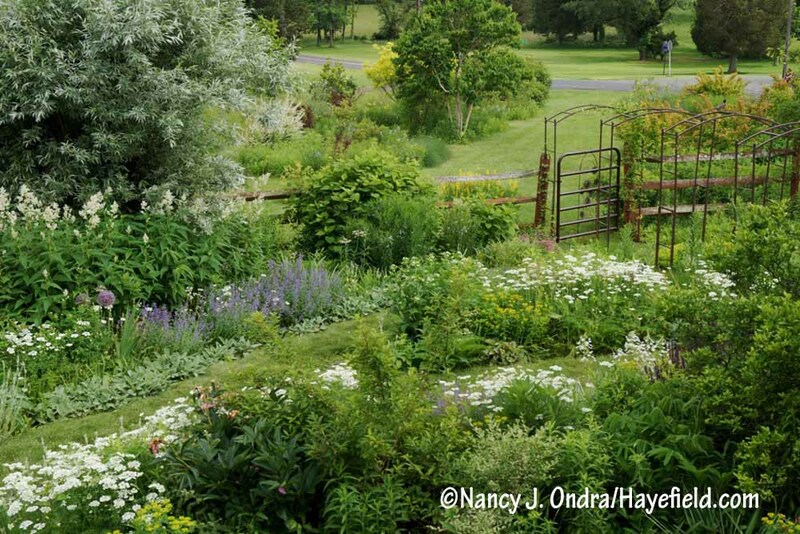 It’s been a wonderful gardening year so far, hasn’t it? I can’t remember where the ‘Drama Queen’ seeds came from originally (quite possibly HPS/MAG! ), but I do have some available in my Etsy shop. Happy Bloom Day, Lorraine! Lovely as always. I was impressed with the fact that Catalpa comes in gold. I shall hunt for that one! Thanks for the inspiration. 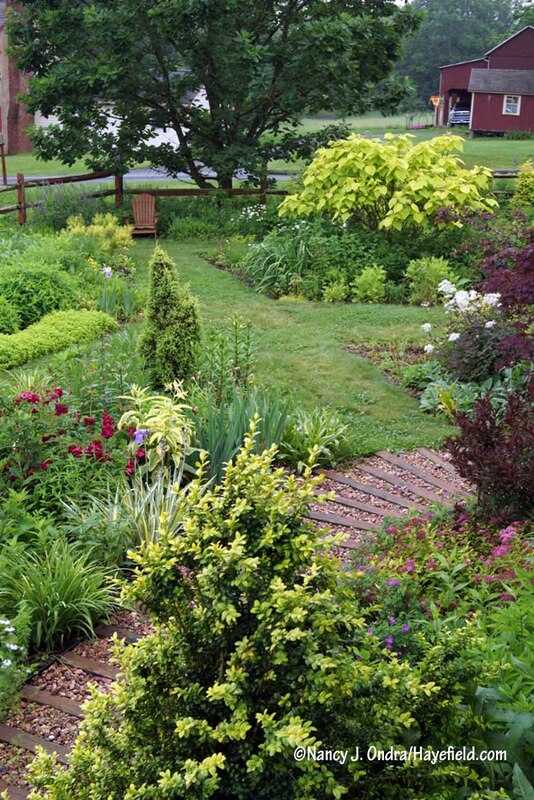 It seems to be hard to find, and boy, does it take a lot of pruning to keep it small enough for a mixed border. But it’s definitely worth both the hunt and the work. My wondering mind wants to know…do you ever forget that you’ve planted something when you discover it much much later? So much to keep track of, and you give us a wonderful tour each month! And, question, do you ever cut back Frau Dagmar? Thank you, once again, for the beauty! Do I ever forget that I planted something? Oh, yes. That’s why I’ve found blogging so useful. I’ve also taken up a trick from my friend Clark: The first time I mention a new plant here, I tell who it came from, so I can find that information later. This is the only form of journaling I’ve ever been able to stick with. To answer your other question, yes, I usually cut her back to about 1 foot every 3 or 4 years. I always feel like a sluggard after reading your posts. I have to come back to these bloom posts more than once to take it all in. What a beautiful garden. I love seeing the over all photos. It puts these blooming plants into the garden. 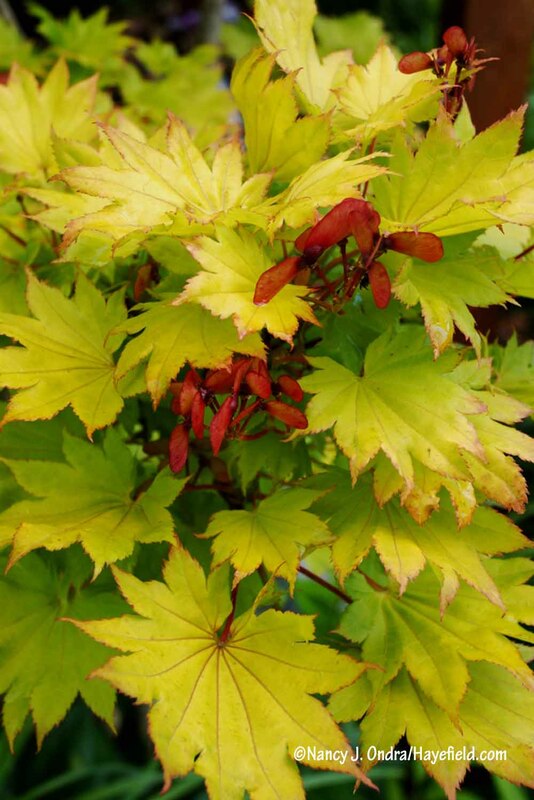 I always see plants I want to try, some I have never heard of or certainly not seen in a garden. A treasure trove for sure. 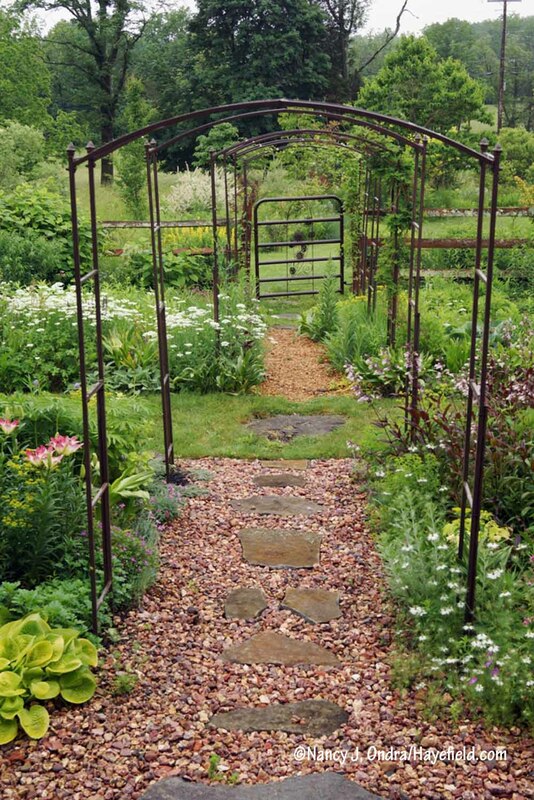 May the weather be kind to our gardens this year. Bloom on…. Any day I can meet a new plant is a good day, so I’m always pleased when I can show others my own new favorites. I really appreciate your comments, Lisa. And yes, amen to gentle weather. Happy Bloom Day to you! Sorry about that, Sharon. I really do appreciate you taking the time to read and comment. Other work commitments make it unlikely that I will ever go back to posting more than once a month, so I try to make that one full enough to last a while. 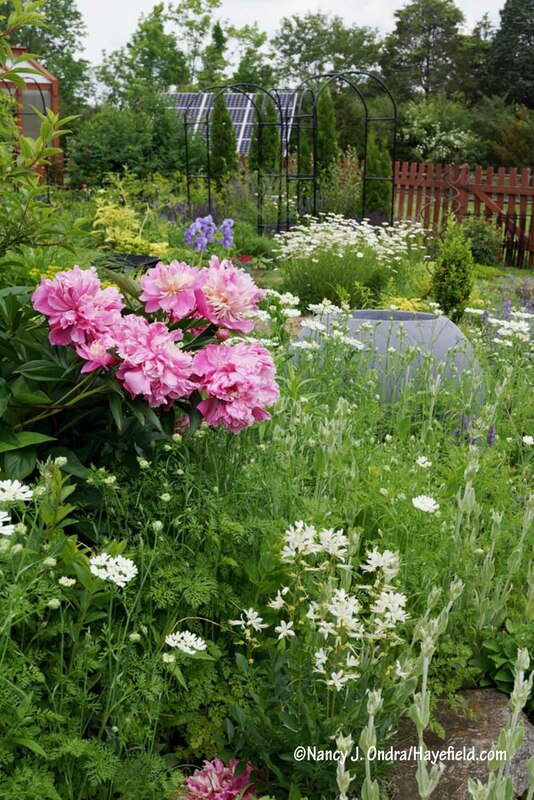 Happy Bloom Day to you, and I wish you much happiness watching the progress of your new gardens! Hello Nan, Yours photos are very, very beautiful !!!! I allready told you : it’s my favourite blog of all gardens I follow ! Thanks to you. Nono (the french gardener). Greetings, Nono, and thank you for reading and commenting. 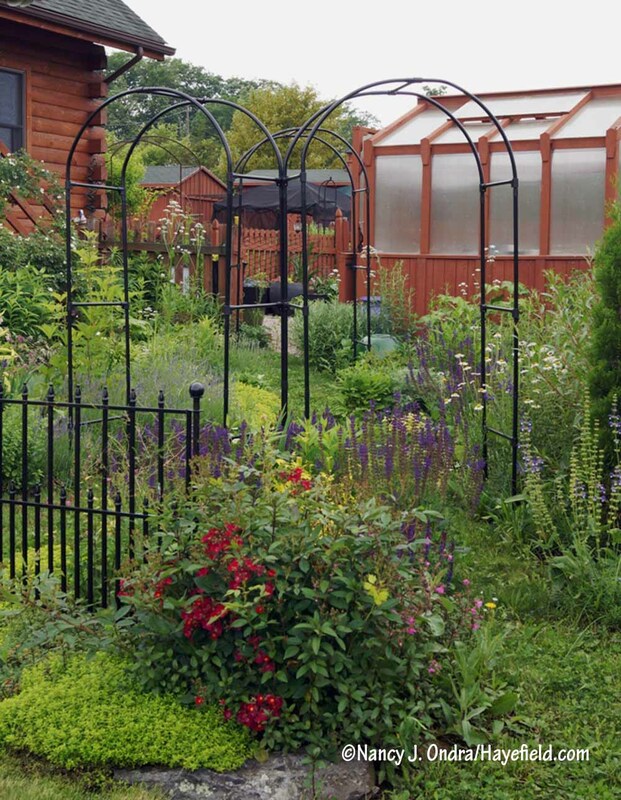 I hope your garden is treating you well this year! So glad the Cynanchum bloomed for you. It will get bigger and better every year! But why is it called cruel plant? I am still jealous of the great deal you got on those arbors. And is that a new greenhouse I see? Hi Kathy! “Cruel Plant” and “Mosquito Trap Plant” seem to be the two most commonly used common names, but I couldn’t find a good explanation for either. It’s still in bloom–well over a month now–in a holding bed. I am on the lookout for a special place for it in the garden. Thanks so much for sharing it with me! The greenhouse…well, it was new in 2014. But it doesn’t often show up in my photos because of where it’s placed, so it’s not surprising that it looks like a new feature. Nan. As always, I find a nice quiet corner where I can lackadaisically stroll through your posts. But it always has to be early in the day so I’ll have time to run to the garden center afterward! I so appreciate your posts, the information you provide and your sense of humor. Thank you for the scenic photos as well. I love the perspective after seeing the up close companions. 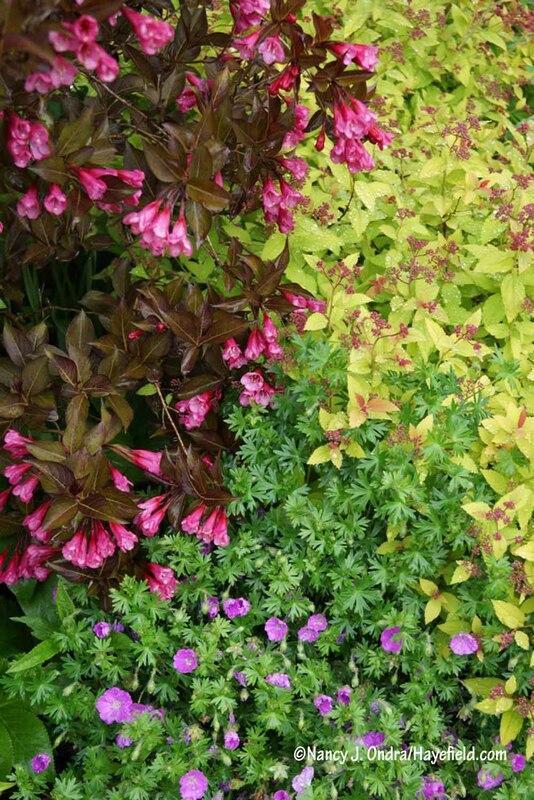 I default to buying pinks and purples, and your gardens remind me of yellows and whites. I am drawn to the moody deep purples like your ‘black Barlow’ Columbine. I’ve added that to my list. I first saw Japanese Burnet here on your blog and have not been able to find it anywhere. Any suggestions (I’ve looked them up and am pretty sure they will grow in 5b). 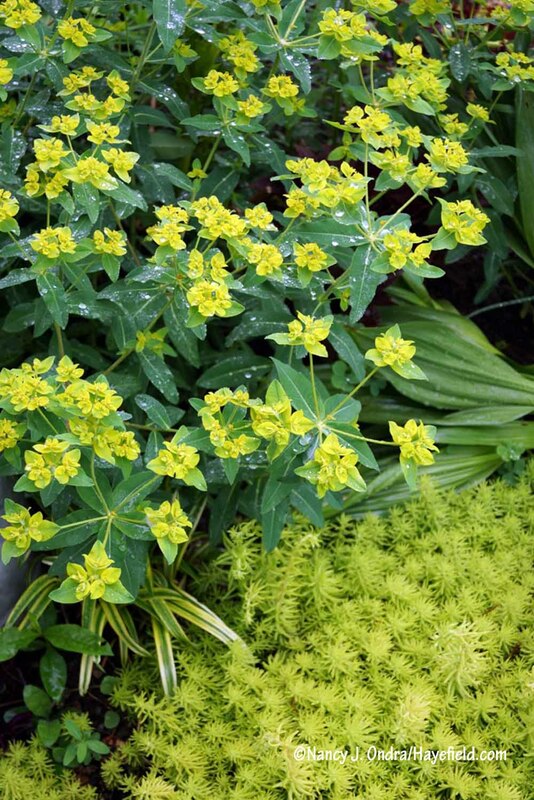 There are a number of plant combinations in my own garden that I’ve taken straight from your blog. Today, I found two more!! Hey there, Shelley. I really appreciate that you took time out of your weekend to read and comment. It’s great to hear that you enjoyed the photos, and even better to hear that you’ve picked up some combinations that work for you. 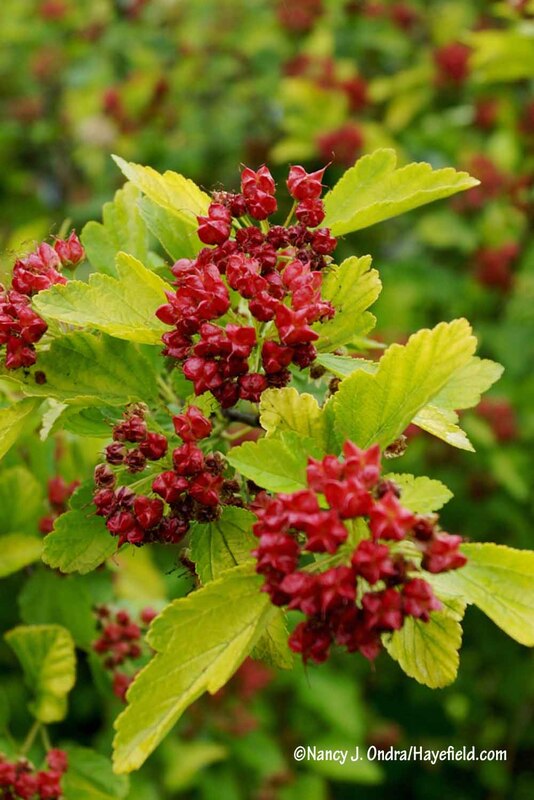 It looks like Avant Gardens currently has Sanguisorba tenuifolia plants available: http://avantgardensne.com/sanguisorba-tenuifolia. 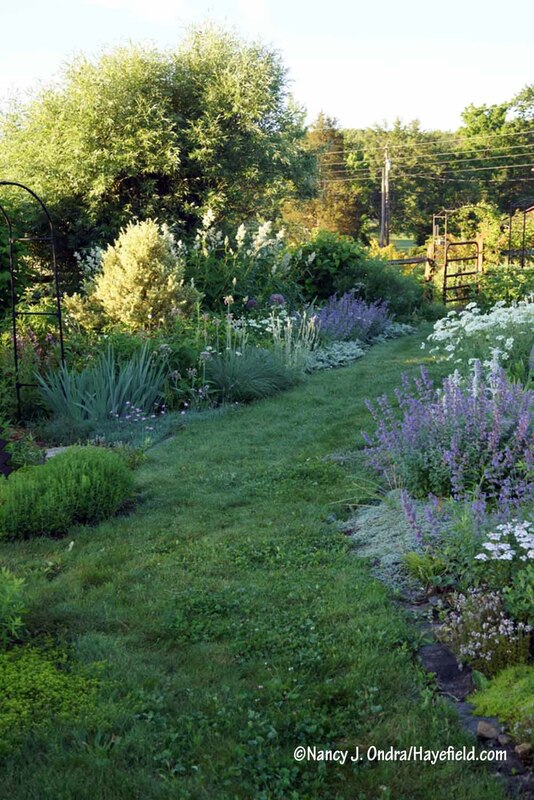 It’s also not difficult to grow from seed; in fact, my plants self-sow all over, even into the grass paths! Hi Nan! Thanks for the garden tour. So lovely and so inspiring, as always. The iris seem to really stand out. Must add more to our garden. Barbara, Victoria, BC. It’s great to hear from you, Barbara. I hope the gardening season is treating you well so far! I tried to get either the yellow or purple catalpa last winter… now I regret it even more that I wasn’t able to find it, it looks great this year. You must be happy to finally have some regular rain back in the garden after last year’s drought. Green and growing is so much nicer a look! By chance were you able to grow ‘Governor Aiken’ verbascum again? I did manage to find a few seeds on mine, but now they’re all blooming yellow so I think the wild V. thapsus got in there. I guess I’ll see what their children look like, and I guess I’ll also have to take a stronger stance against the wild ones since I do tend to let them go! Hi Frank! 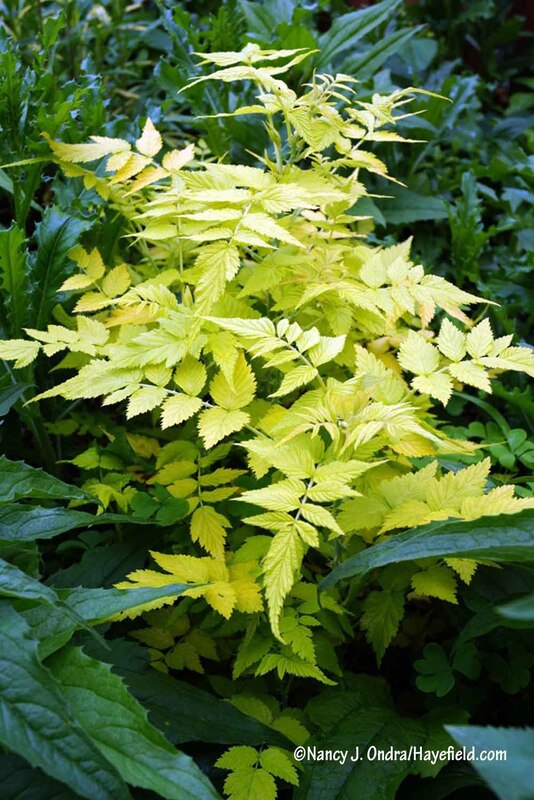 I wonder why the golden catalpa is so hard to find now. I’d considered getting the purple one too, but maintaining just this one takes a fair bit of time and garden space. I think the purple one loses its color in hot weather, too. Speaking of weather, yes, this has been a top-notch season so far for gardening, with regular rain. 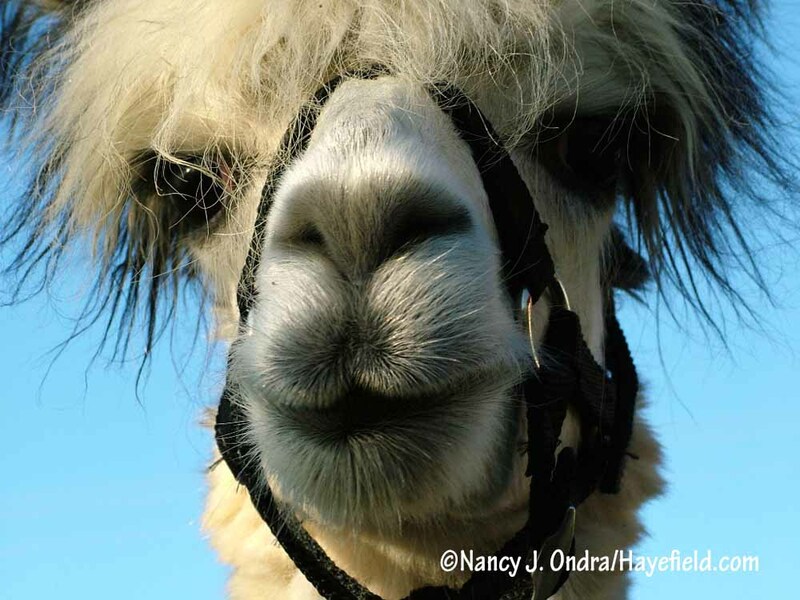 Not so good for haying, though, which is a worry, though Duncan certainly isn’t lacking for pasture. I do have a couple of self-sown seedlings of the ‘GGA’ mullein this year. I wasn’t sure if it would cross with V. thapsus, but I made a point of keeping any nearby thapsus deadheaded, and my ‘GGA’ are still white. If you want some of last fall’s seed so you can start new plants this summer, feel free to email me. Thanks for the offer, I may take you up on it! Right now I’m pleased to see that although I have yellow blooms on my ‘Not really GGA’ the flowers are much larger than the straight V. thapsus and it’s an impressive plant overall. I may see what the next generation of seedlings turn out to be, maybe I’ll get lucky and see some white flowers return! 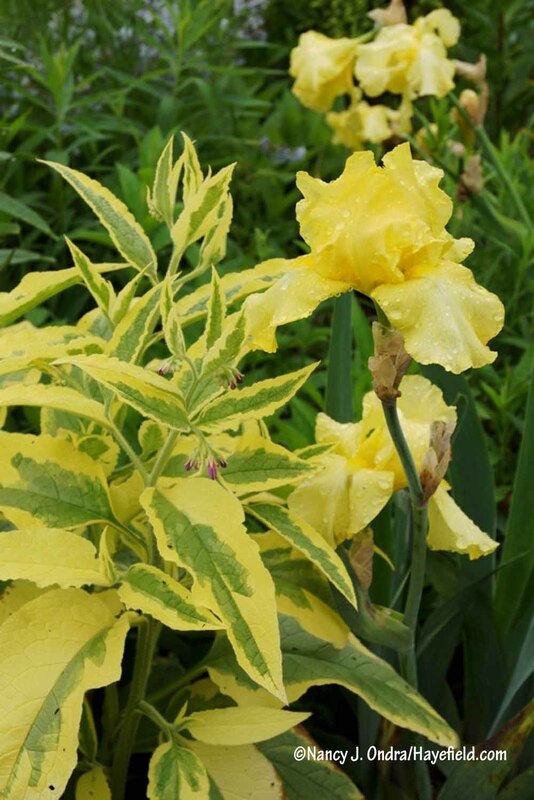 I have another thought: Gardens North offers seed of Verbascum ‘Electric Yellow’ (White Form), which looks very much like ‘Governor George Aiken’, and the description says “This is the lovely white form of the large-flowered Verbascum ‘Electric Yellow’. Open pollinated, so you will likely obtain yellow forms as well.” I wonder if it is the same strain. 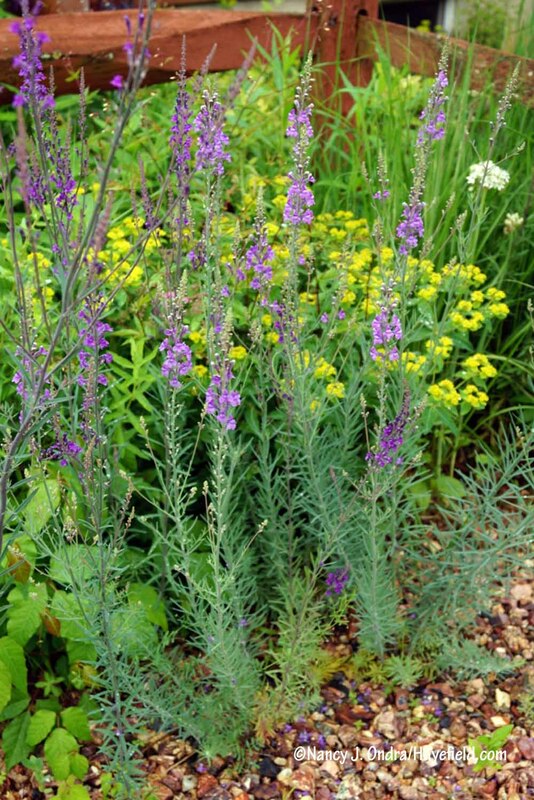 See what you think, if you want: Verbascums at Gardens North.